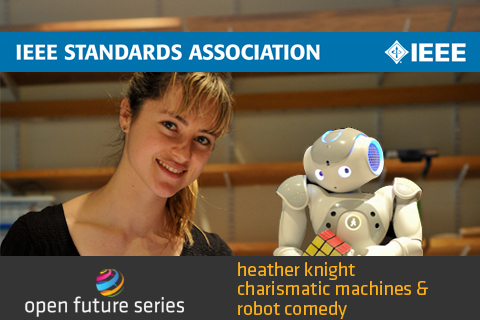 Meet Heather Knight, Electrical Engineer and Roboticist, and her robot, Data. Heather designs unique interfaces between people and machines that incorporate body language, personality, humor, temperament and spectacular stylings. Leveraging her research, Heather will explore the ways psychology, expressive emotion, behavior system design and art influence the positive evolution of charismatic technology. In an age where highly capable machines enter our daily lives, social robotics focuses on how machines can empower people – not replace them. Machines that fail to interact appropriately with people run the risk of becoming irritating and unwelcome. However, when personality and charm are added, functional machines can not only empower people – they can engage, inspire, elicit trust and foster bonds with their human partners. Brought to you by IEEE.